To make sure that it is easy and safe to have all necessary heads and tips with you while you are fishing, Vision has introduced two wallets, one for the tips and one for the heads. Both wallets are black/white coloured and the larger Head wallet includes the Ace of Spey theme decorations. Both wallets have light mesh walls to divide them into sections for individual heads or tips. The ultimate shooting head wallet with tough 6mm storage bags arranged to allow easy viewing and flipping of heads. The bags are large enough to hold regular shooting heads, skagit shooting heads and long Scandinavian shooting heads and 12 bags per case leave plenty of room for a varied selection of Rio heads. 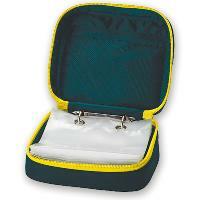 A folding wallet, containing a set of 10 heavy duty, clear minigrip bags, to hold all your different leaders. The Polybags are removable and available separately, so different sets of leaders can be stored in each bag and placed in the wallet as and when required. 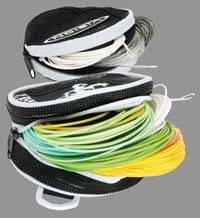 In addition, two open-top mesh pockets, allow licences and other accessories to be stored safely. Leather has always been one of the traditional materials for game fishing accessories, attractive and hard-wearing.